At ROSES ARE RED, we have been in business for over 10 years and we specialize in unique flowers and long vase life. ROSES ARE RED believes that flowers make a difference and are the perfect gift to celebrate life. They bring joy, the perfect thing to represent the emotions you are trying to send. Our designers all are truly passionate about flowers and have seen first hand the delight that flowers bring people and we work tirelessly to make each gift truly special. We work hard to make sure that we have the best selection of unique blooms and follow the most current research to give you the best possible vase life so that your flowers can have the best impact possible. 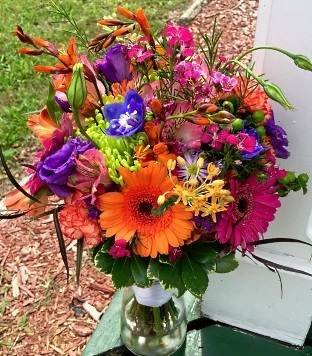 We are a professional local florist proudly serving Indialantic, Florida and the surrounding areas of Melbourne, Melbourne Beach, Indialantic, Indian Harbour Beach, Satellite Beach and Viera. Our friendly and knowledgeable staff is ready to assist you when you need flowers delivered locally or anywhere in the world. 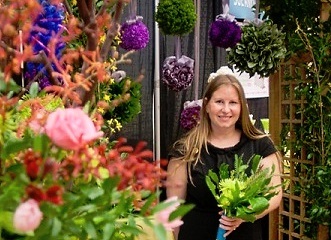 Owner, Christina Brown has a natural love of flowers and plants. Even as a child she had a flower garden she planted and tended with love. Later that passion led her to get her Batchelors in Horticulture from the University of Florida and become a Florida State Master Designer. Owning a flower shop fulfills her life long dream of owning a business that allows her to share her love of plants and flowers. She also speaks at local garden clubs and loves to chat with customers about all their plant questions. So we aren't content with the ordinary. We buy some of the coolest flowers we can find every week. That means you can have the coolest flowers in your arrangements! Our wholesaler knows we like unusual stuff so they set us up with some direct buying opportunities (they handle the shipping part) so we can try out new and unusal varieties and types of flowers. We test them out to make sure they have a great vase life (because if it doesn't last it doesn't meet our standard, we don't want anyone disappointed in their flowers) before we will sell them to our customers. If they pass our tests and our customers like them we give that feedback to our local wholesaler so they can start carrying those new varieties for our other florist friends. We are committed to raising up our whole industry, but we do like to have the best first! Our Guarantee: for retail arrangements we want you to love your flowers! If you or the recipent doesn't like their flowers for any reason--the colors, the types of flowers, the style, or the quality--we offer a 48 hour exchange guarantee and are happy to exchange the flowers for an arrangement more to their liking. We don't have to change out flowers often but please, please, please let us know if you are unhappy in any way with your arrangement so we have the opportunity to correct it. Our shop is located on State Road 192 Beachside (5th Ave) just past Riverside Drive if you are coming from the causeway, and our parking is on 6th Ave. Whether your wedding or party is formal or casual… A small gathering or the social event of the year… At Roses Are Red, we can help you plan an event that's the talk of all your friends! Our goal is to bring the joy of flowers into the celebration of your wedding. 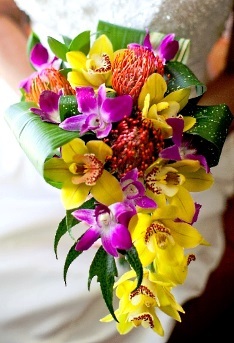 We do about 150 weddings a year and are one of the top wedding florists on the Space Coast. We have worked hard to earn a great reputation and have been chosen to be on the preferred vendor list of just about every major venue in the area. We also help with those going the DIY route. Bring in or email us your inspiration pictures and we can help you do your stem counts and help you pick out glass to buy or rent, or even fill your own containers. For Weddings and large events please call us in advance at 321-723-3232 to schedule your consultation. The loss of a loved one is very difficult. We consider it a true honor to create arrangements of flowers to remember someone's life or to send comfort to someone grieving. There is something truly beautiful about flowers that are a temporary beauty used to represent life that seems so brief. Flowers speak comfort in a way that nothing else does. The look of peace or a sweet smile from someone who is obviously grieving when we deliver flowers to someone's home is something we wish we could capture to return to the sender. Every time they walk past those flowers they remember that someone is thinking of them and they are not alone in their grief. 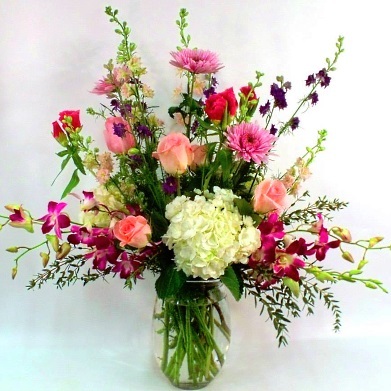 We will design and deliver an arrangement that beautifully conveys your feelings of sympathy or remembrance. If you don't know what to pick we recommend talking with one of our designers. 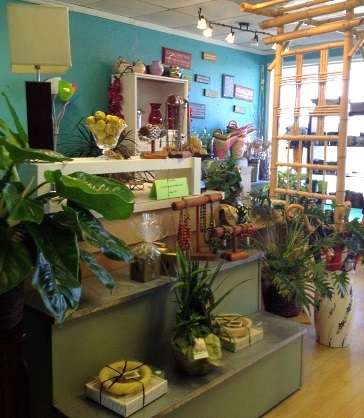 We invite you to stop by our showroom to see what's new and choose from our selection of beautiful house plants. We try to keep a unique selection on hand of inside house plants--orchids, ferns, hanging plants, bromeliads, dishgardens and more. We stick to stuff that is fairly easy to care for either for yourself or to send as a gift. Got a question about plants, we do our best to help you troubleshoot your houseplant problems or to pick the perfect plant--right plant right place! Thank you for visiting our website and learning a bit more about us! If you are in the area please stop by. We especially like to meet our out of town customers, so drop in and introduce yourself so we can put a face with the name, sometimes we feel like we are old friends because we have celebrated so many occasions together. But if you can't and we are closed or if it's after hours and you need flowers secure online ordering is always at your fingertips, anytime day and night, for your convenience!